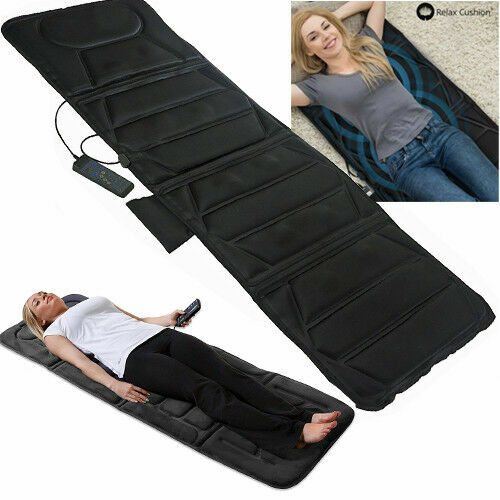 Enjoy the perfect massage from the comfort of your own home with this full body heated massage mat. Just the thing after a hard day at work or for some weekend relaxation, simply unfold the mat, lie down and switch on - the massage mat will do the rest. Using the easy-to-operate remote control you can take your pick from five different massage modes (pulsating, tapping, rolling, kneading and auto) and three levels of intensity to enjoy the perfect massage. You can also choose to target your neck, upper back, lumbar region or legs, and there is even a soothing gentle heat function to complete the experience. The mat measures L177 x W70 x H4cm but will fold down to just L60 x W45 x H10cm for convenient storage, with straps to keep it in place once folded. Mains powered. 184cm power cable. 40% cotton, 60% polyester construction. It is recommended that if you have a pacemaker, consult with your GP prior to using this massager. Clean only with a soft damp cloth or sponge..